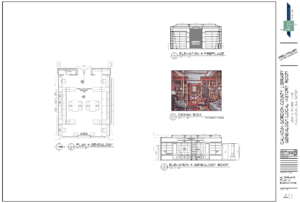 The design drawings for the Calhoun-Gordon County Library History Room incorporate special collections materials and technology. Photo Provided by KCP Architects. The Calhoun Public Library is about to begin the construction phase in a renovation and repurposing project dedicated to the local history room. The community partners, local and state legislators have supported the library’s efforts to reimagine this space within the public library. Architect Kenny McDade with KCP Architects in Ringgold, Georgia is working with the library to create an exceptional space within the beautiful library building located at 100 N. Park Avenue in downtown Calhoun. Our goal is to appropriately house the existing collection and make available to the public, many important documents and electronic resources for the history specialist or the curious novice. Imagine the space: beautiful shelving, well-designed lighting and seating paired with design elements that tie the space to other lovely spaces within the library. 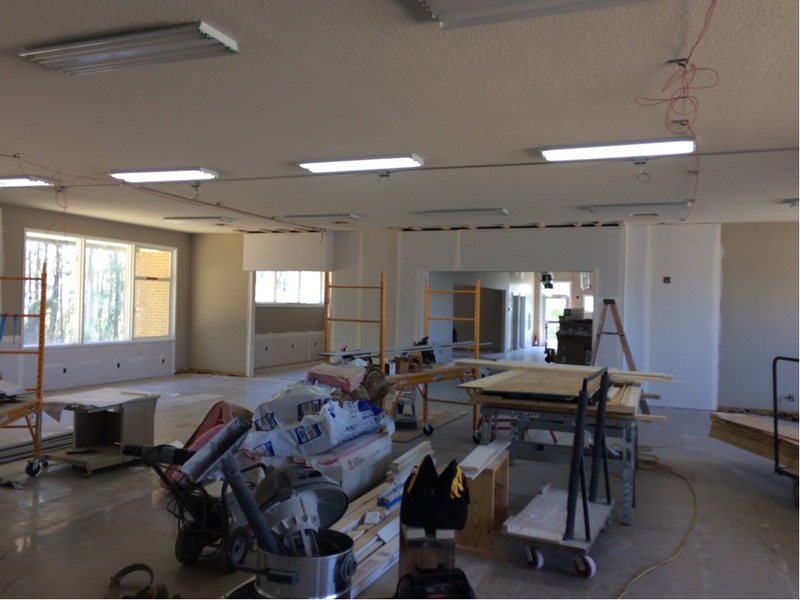 The room was removed from the scope of work at the time of the original renovation due to budget constraints. The library board of directors and library staff have worked with architect designer David Cameron to choose seating and shelving for this valuable space. The items were selected to enhance the public’s experience of the collection and equipment. Luckily, the library has access to former board members Dr. Ed and Mrs. Jane Weldon, who have dedicated their time and knowledge to develop the collection. Dr. Weldon is a retired director of the Georgia Archives. We anticipate the construction, renovation and setup of the new space to take about four months. The Chatsworth Public Library is smack in the middle of a renovation and repurposing project. The project was funded by grants from the state legislature and secured with help from the local community, the city and the county government. The greater North Georgia regional area has come together to bring this project to fruition. Donations of materials, time and talent from our business and industry partners along with the public supporters of the library have made the “new” library possible. The renovation and repurposing project is scheduled to complete this summer. Photo provided by the library. The library board of directors as well as the library staff have worked with architects, designers and the state library staff’s director of construction to repurpose this building. We have not added any square footage; however, we have transformed the building from the studs outward. I’ll include a photo that shows the project at about fifty-percent completion. I cannot wait to see the completed spaces, the newly designed exterior and the new computing and teen areas. And last but not least is the Dalton Public Library design plan moving on to the beginning of phase two of the extensive renovation and repair project. We are enormously pleased to announce that we are free from the perpetual leaks and collection destroying dripping rainwater that were part and parcel of the old, flat roof design. Carlson Architects has worked for nearly three years along with Felker Construction to perfect the design of our new roof system. It’s a sophisticated design, fabricated onsite by a roofing specialist company from New Braunfels, Texas. This group secured the bid and worked with us to keep the library open for the public throughout the construction phase. The roofing construction team led by Marty Bowels meshed with the library users and staff – while providing a safe area at all times. The library staff, board and I are extremely pleased with the project. The Carlson team are putting the finishing touches on the phase two work as the HVAC team from ICON mechanical and local engineer Frank Hogshead work to correct the existing HVAC system and repair the ductwork and control “irregularities” that make a visit to our library similar to a world tour. One section is dry and stiflingly warm, while my office is so cold I must have a blanket at all times at my desk. The existing temperature control system was inefficiently operating the HVAC system and thus adding to the cost of operation of the 32,148 square feet of interior space. The Friends of the Library book sales and warehousing space will be integrated into the new controlled system. The largest of our public multi-purpose meeting spaces is getting a refresh. The walls have been repainted, and thanks to product donations from Shaw Industries, it will soon receive new flooring. The larger meeting room space was not included in the 2016 flooring project because the existing flooring was in excellent condition. However, with the tremendous spike in attendance at library programs and local use of the free meeting space, the flooring has taken a beating. It’s a good problem – being very busy at the public library is always a good thing. A refresh of the public restrooms has moved to the top of our project list. We are developing a plan with a designer to bring new toilet partitions and an upgraded handwashing area to the space while keeping the existing flooring in place. Our local gardening volunteers are eager to begin working to beautify our campus for springtime use by the public. We hope to meet with them soon to begin that work. We appreciate each person who has played a part in the refreshing of each of our wonderful public library spaces. I would also invite you to visit our satellite unit, inside the Eton, Georgia city hall building. The Eton City Hall staff and the Chatsworth Library manager saw a need for a local computing and printing area. The Eton City Hall generously offered a space for our technology librarian Betsy Powell to install two computers and a printer for public use. I wish for each of you a glorious spring and summer!